The super high-pressure briquetting machine is a special equipment designed and produced for the fine-grained (300 mesh or more) and light-weight powder based on the high-pressure briquetting machine. It has many advantages like high pressure,good sealing effect,high efficiency and so on. The briquetting machine with a line pressure of 11T/CM can be called ultra high pressure. Ultra-high pressure is suitable for forming the formation of calcium carbide, ultrafine powder, etc. The pre-pressing transmission of the super high-pressure briquetting machine adopts the structure of a direct connection with the hard-tooth reducer motor. 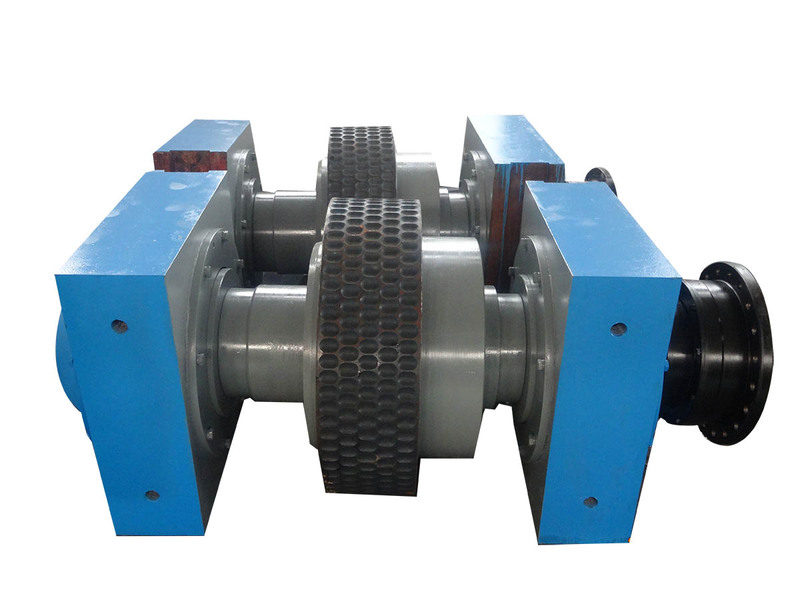 Compared with the traditional open-belt drive, it is more stable,reliable,compact and sealed, which can avoid dust from entering the transmission system.The motor adopts a hard-tooth surface reducer with a direct connection structure. 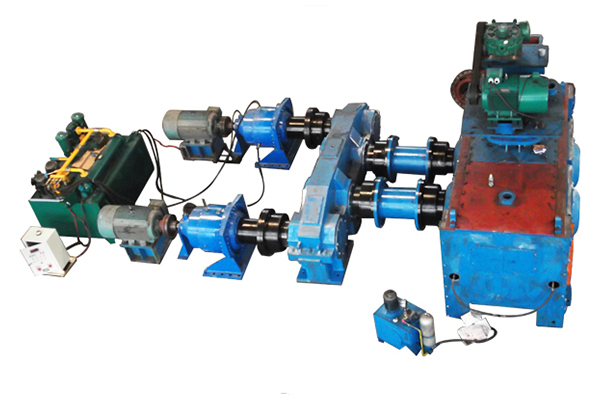 Compared with the traditional briquetting machine motor that through by the pulley or coupling and the worm gear reducer connection structure, its power transmission efficiency and accuracy are greatly improved, and the feedback on the pre-pressing motor on the electronic control system is more direct and accurate. The sealing device around the roller shells of the traditional briquetting machine adopts steel structural, for which,there must be a certain gap between them to avoid rubbing. The sealing effect is poor, and once the roller shell may be damaged or even dropped when displaced or rubbed.The scraper and arc baffle on the guide nozzle of the pre-presser of the super high-pressure briquetting machine are made of special wear-resistant composite material, which forms a multiple contact seals together with the roller shell to replacing the old-style steel structure labyrinth seal, which not only greatly increases the tightness of the triangular compression zone to avoid the occurrence of large amount of leakage raw and spray material, but also can effectively protect the roller shell from damage because of the elasticity of the material itself , thereby greatly increasing the briquette formation rate and reducing useless energy consumption. The hopper and spiral of the super high-pressure ball press pre-presser can adjust the fine powder material with high gas content and strong fluidity. The silo and the feed inlet are enlarged to ensure sufficient material in the silo, and the material pressure of the pressing zone is greatly improved, which perform a better briquette forming effect.In addition,the whole silo adopt a closed structure,except for the air outlet,to ensure that the materials cannot overflow.According to our rich experience on briquetting, we have improved the lead, angle, length, precision of the spiral, so that the push material is more sufficient to facilitate the formation of the final briquettes. 1. The equipment is supplied as right-installed generally. Please specify in the contract if it needs to be installed at left. 2.The capacity and energy consumption of the briquette machine are related to the material characteristics,final briquette size,etc..
Roller assembly is the core part of briquetting machine. Particles are fed by squeezing them between two rollers rotating in opposite directions and then form final briquettes. 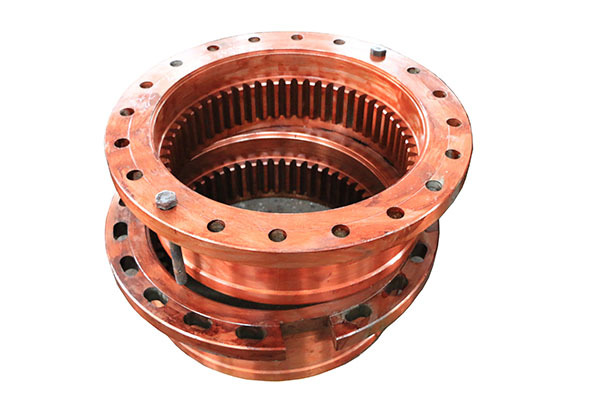 It is composed of items such as main shaft, roller shell, bearing, bearing support and seals. Adopting high quality bearing steel, integral rollers are finished by multiply processes such as machining, UT, milling, hot treatment. After hot treatment, its surface hardness could be up to standard. All rollers are high wear-resisting and replaced easily. The main shaft is made of forging 40Cr, which is processed by multiple processes and processes such as drilling, turning, heat treatment and milling. 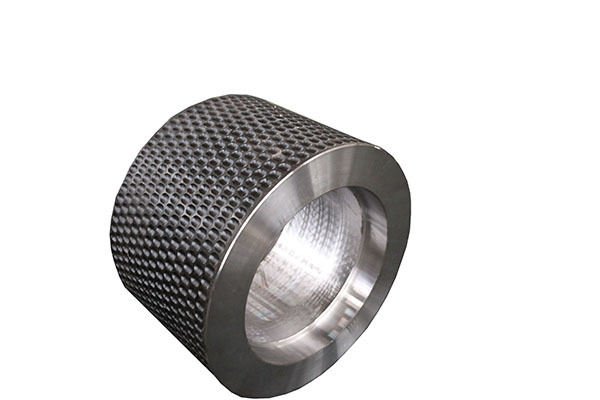 The roller shell is made of high quality bearing steel and is processed by multiple processes such as turning, flaw detection, milling and heat treatment. The surface hardness can reach above HRC58. Internal ring gear and external gear shaft sleeve are adopted high quality alloy steel and processed by turning, milling, drilling, hobbing,grinding,hot treatment and so on.